Today we arrived in the early morning and had a great view of the town as we arrived from our balcony. There is nothing better on an Alaska Cruise than a balcony cabin! Almost every morning we order coffee and croissants from room service and just sit an enjoy the scenery as we awaken and prepare for the day. 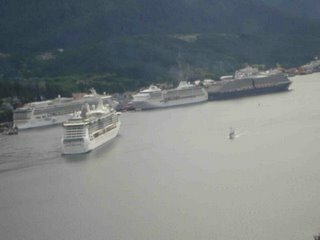 Many cruises is is not as big a deal, but for Alaska you are almost always close to land and the spectacular scenery. Today we have booked a floatplane tour to the Misty Fjords National Monument! We are a little nervous as we join or group for the transfer to the marina - the weather is beautiful, but full of clouds and far off drizzle! The trip is about 2 hours long, flying out of the marina and over a few islands to reach the Park, then we tour around some of the volcanic mountains, drop into the canyons for a close up view and then actually land on one of the hundreds of lakes we cross for a close up look! IT WAS AWESOME! 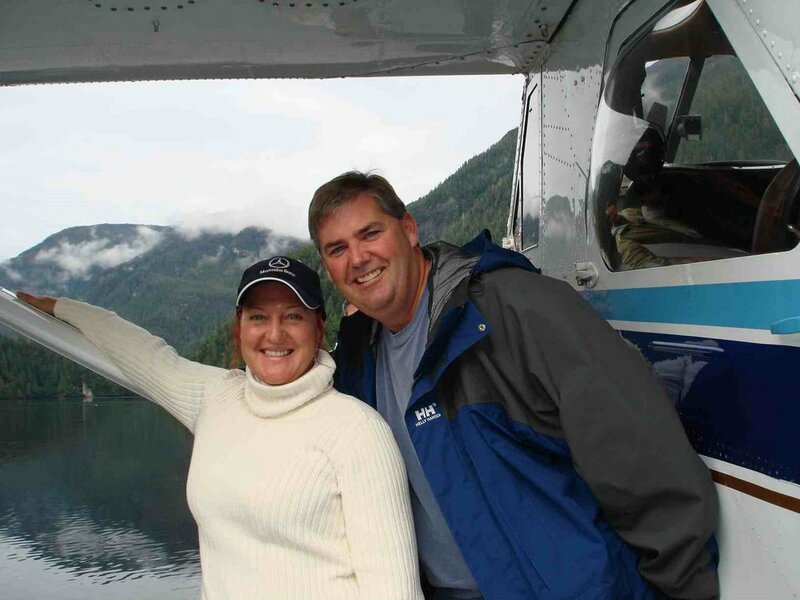 We had a great pilot who has been in Ketchikan for over 30 years and was really good! I got to sit in the front seat as the co-pilot and had a ball! On the return flight we flew really low through the canyons and just kissing the mountain tops as we flew below the clouds back to the harbor. Upon our return we got a great view of the four cruise ships in the harbor, and landed right next to the Serenade of the Seas - right next to it! Today we leave early from town, so it was off for shopping and then boarding by 1:00 PM. Tonight we are having dinner in the Pinnacle Grill with some friends. The Pinnacle Grill is Holland America's upscale alternate dining experience. It is a small restaurant on the ship that only seats 60 - 80 guests at a time. All the meals onboard Holland America are exceptional, but we hear the Pinnacle is just superb - and we can hardly wait!